Can you remember life before the World Wide Web? It happened, and it seems like 100 years has passed since we first opened Netscape or Internet Explorer to “search” for a recipe or a news source. It was a simpler life, from a content consumption and communication point of view. If you wanted to see what was happening in the world, you turned on the radio (AM or FM) or the television (basic cable). You read the newspaper or a magazine. Then came the web. And email. And instant messages–text messages, smart phones, social media. The list goes on and on and on. As we approach 2016, the many ways we have to communicate and to create/consume content seem to be endless… and growing by the minute. Twitter. Facebook. LinkedIn. Instagram. Webio. WhatsApp. iMessage. Path. Blogs. Email. SMS/MMS. Television. Newspaper. Magazines. Radio. Podcasts. YouTube. Vimeo. And that’s just what I can list off the top of my head. Information overload can be a real problem–both personally and professionally (big data!). How do you take all of that “big data” and distill from it the information that really matters? How do you reduce the noise and find the conversations you care about? How do you keep up and actually stay ahead? That is a question I often hear and fortunately one that is answerable. Answerable, and thanks to technology you certainly don’t need to be a data scientist to interpret big data. 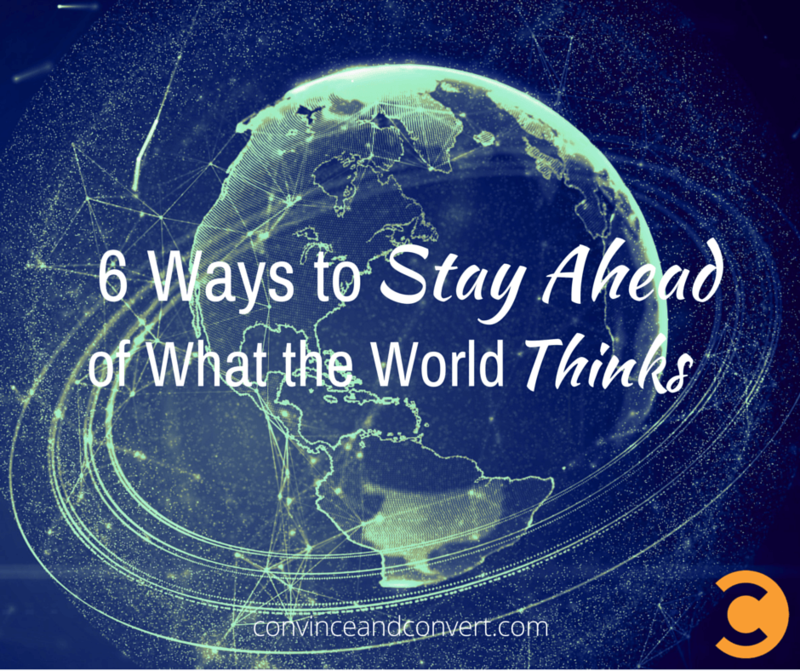 Below are 6 ways to stay ahead. This may sound obvious, but so many people miss this very important step. What matters to you? What do you need to “stay ahead” of? Your competitors? Your industry? Your customers? Specific topics? Do you want to be in the know around global issues? Local? Both? This is arguably the most critical step in clearing out the noise. Said another way, 42. Do you need this information now, immediately, in realtime? Would updates and alerts at certain times per day suit your needs? While I could make an argument for every company needing to see information in realtime, there are plenty of use cases where a daily update would work just fine. Or even a “what you missed” update on Monday. While the media loves Twitter, the story is bigger than any one social network. Don’t forget “traditional” media as well – Television (broadcast), Print (newspaper, magazines), blogs (scary that blogs are now traditional media, right?). To truly understand the full conversation, pulling in as many media channels as possible is key to knowing the full scope of the stories and events that are integral to your business. Being a regular reader of the Convince & Convert blog, you already know that not all influencers are created equal. It is critical to know who and which media is influential for your company or brand or product. To be clear, it is not always the same people and media that are influential at the right time. Once you have identified your influencers, pay attention to what they are saying, read what they are writing, and engage with content they are sharing online. Depending on the influencer, she or he may be on the leading edge of what is happening in your market or industry. Said another way, your influencers may be creating the news. Remember those days when you were in the (shopping) mall and someone with a pen and clipboard nearly tackled you? The next thing you knew, you were in a room with a dozen other suckers tasting chips and being scrutinized by a group of researchers whose number one goal was to decide which chip should be mass produced for the market at-large. Don’t get me wrong, I still believe there is a place for focus groups. However, if you really want to stay ahead of what the world thinks and listen to what real people are saying (and sharing) in realtime, you need to follow what’s happening across social media, news, blogs, broadcast, print, and more. If you truly want to stay ahead, it’s imperative to be alerted the second a story breaks. Seeing the news an hour after it has been published is often too late. And, once everyone else has talked and shared an opinion about the story, it is way too late. However, it is also not realistic or scalable to see every piece of news (or mention) as soon as it is publicly posted. This is where thresholds come into play. Similar to #2 above (Frequency), there are instances when you may want to be alerted only after, say 10 mentions of your brand occur in a one-hour period. Or, to get even more granular, maybe you only want to be notified if an influencer (see #4) publishes a new story or shares relevant content. We live in a society today where the life of a story can be quite short. The velocity and reach of a story can, respectively, be lightning fast and ridiculously broad. And not long after it has been covered, the media and then the public will move on to the next big story or event, which could be good news about the competition. Maybe is is a matter of attention span. Maybe it is related to the sheer volume and ease of mass distribution of information in today’s world. Either way, if you want to be successful, it imperative that you stay ahead of what the world thinks. So, what are you doing to ensure you are not missing out on the story from the last hour? Director of Marketing at Zignal Labs | University of Michigan Alum | Parent of 4 (#TwinsLife | Lover of beer, coffee, and people (in no particular order). Yeah, you’re sending email. But is it email that people WANT or email that people TOLERATE? The difference is critical, and our brand-new, eBook shows how to do it right.